The last time I made this was in July of 2000. We had friends over with their children, plus our children and my Mom too. It was pretty ambitious, now that I look back on it. I think I made 2 other grilled items because I wasn’t sure everyone liked shrimp (the children were young, my son was 8 at the time and he wasn’t the youngest) but for the life of me I can’t remember what. I may stumble upon them like I did this one. I hope so, because this one’s a winner. This recipe has 3 parts: the broccoli slaw, the grilled shrimp and the toasted garlic bread. I will try to help you prep as much as possible so that it will go smoothly. Just a side note, shrimp marinating too long is not good. If there is any acid in the marinade, it will start to ‘cook’ the shrimp. Not really what you want. So adhere to the marinating time. Before you get started, review Grilling post, if need be. 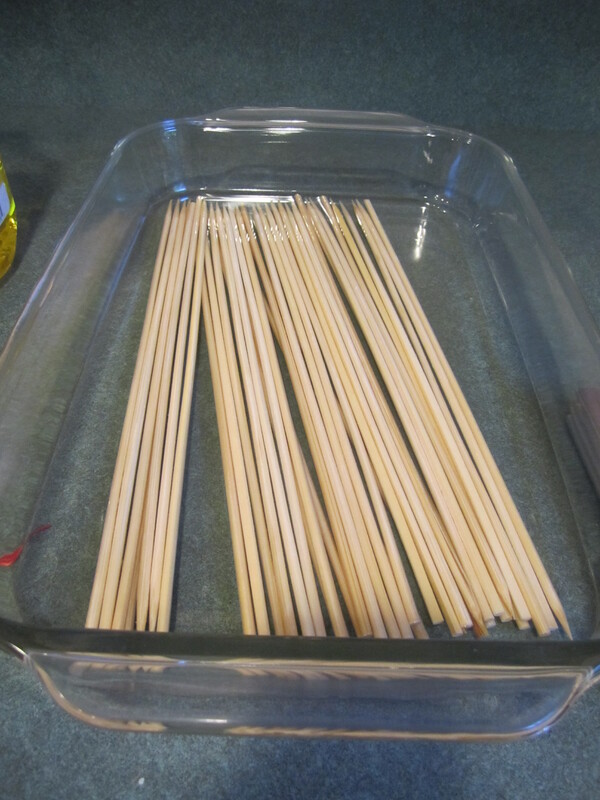 Place about 10 skewers in a large shallow glass dish and cover with water. Soak for at least 30 minutes or longer. Add the first 5 ingredients in a large bowl and whisk to combine. 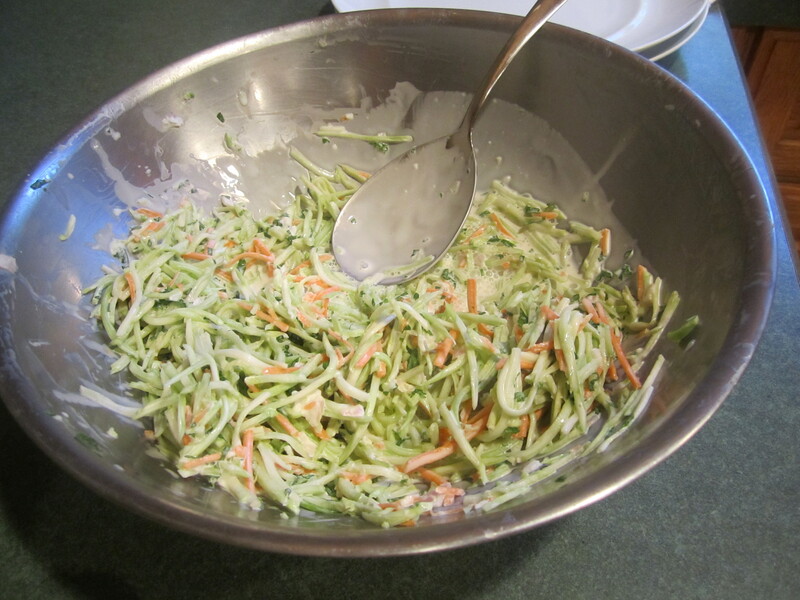 Add the Broccoli Slaw Mix and toss to combine. Cover with waxed paper and refrigerate. Stir before serving. Add all ingredients into a large glass bowl. Stir to combine with a whisk. Pour off and measure 1/4 cup into smaller glass dish. Set aside both into refrigerator until the shrimp are ready to marinate. 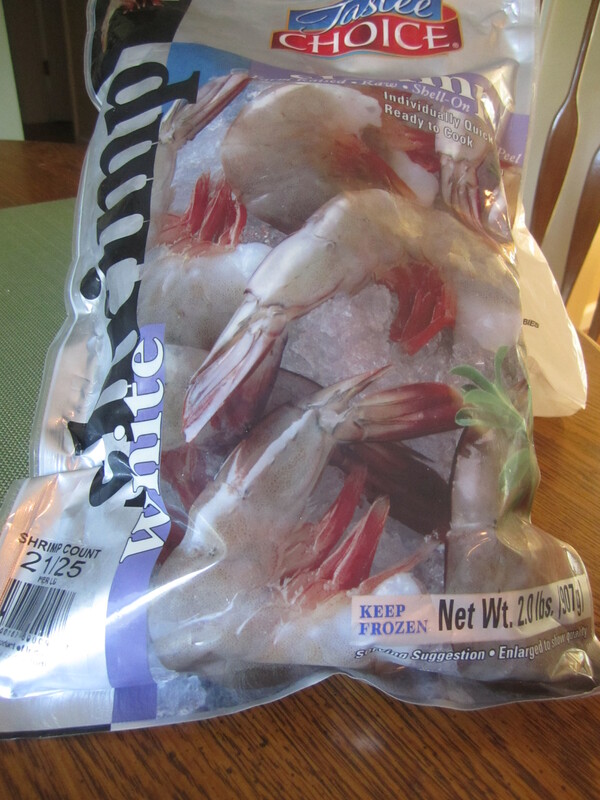 If frozen, defrost shrimp per instructions on bag (they should already be deveined) and peel off shell and remove tail carefully. Set aside in refrigerator. If fresh shrimp, peel, remove tail carefully, devein and set aside in refrigerator. Spray disposable aluminum cookie sheet with canola spray and set aside. Put tomatoes in small glass bowl and pour olive oil on top. Stir together gently and set aside. 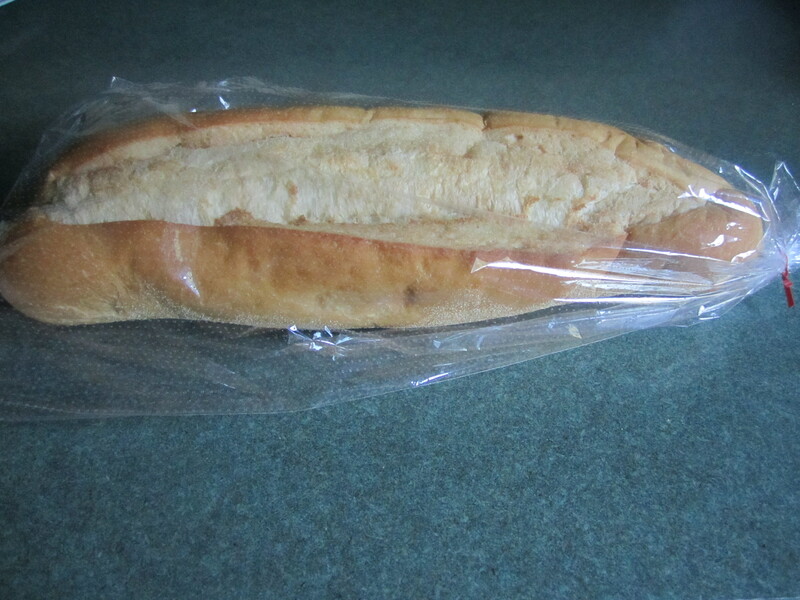 Cut the bread into generous 2 inch slices. You should get about 4 – 5 slices this way. Take each slice and cut in half, BUT NOT ALL THE WAY THROUGH. You want to create a hinge. This way the shrimp and tomatoes and slaw stay in the bread. Set bread aside. 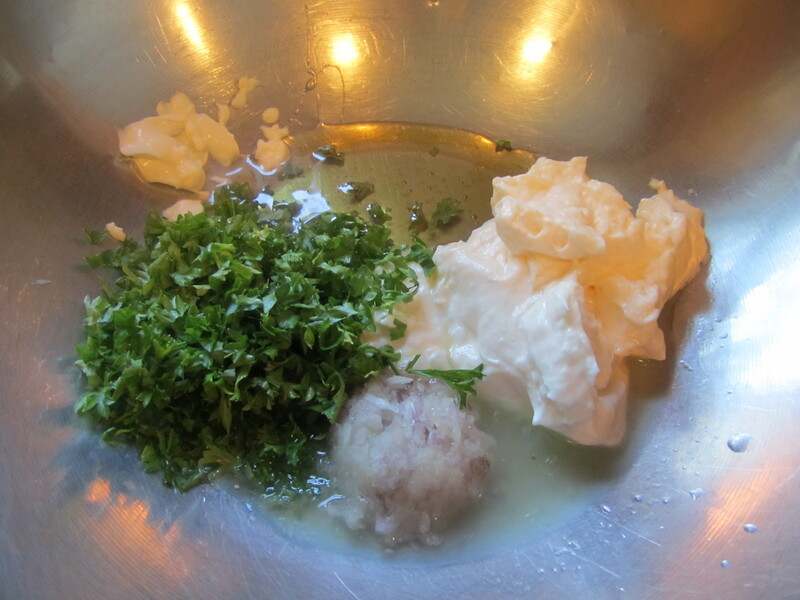 Melt the butter in a small saucepan and add the garlic. Stir together and set aside. 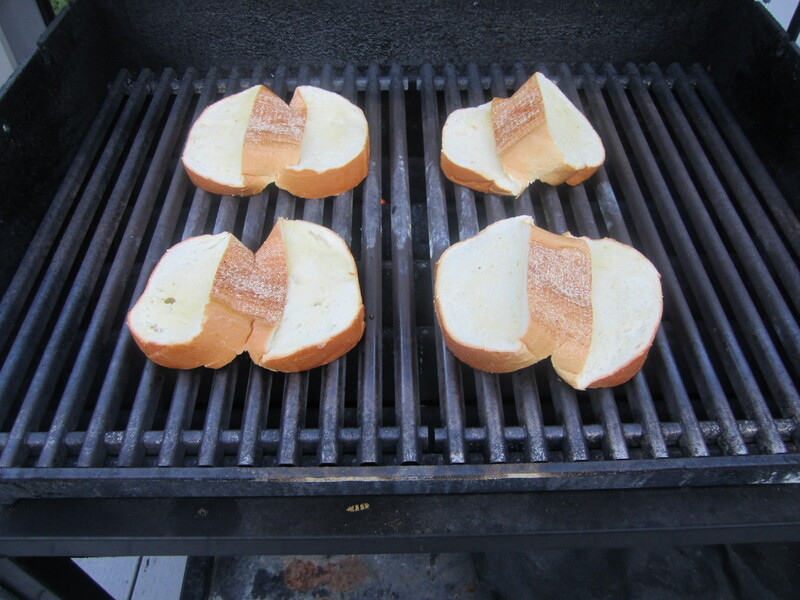 Pre-heat your grill. This will take 15 minutes. 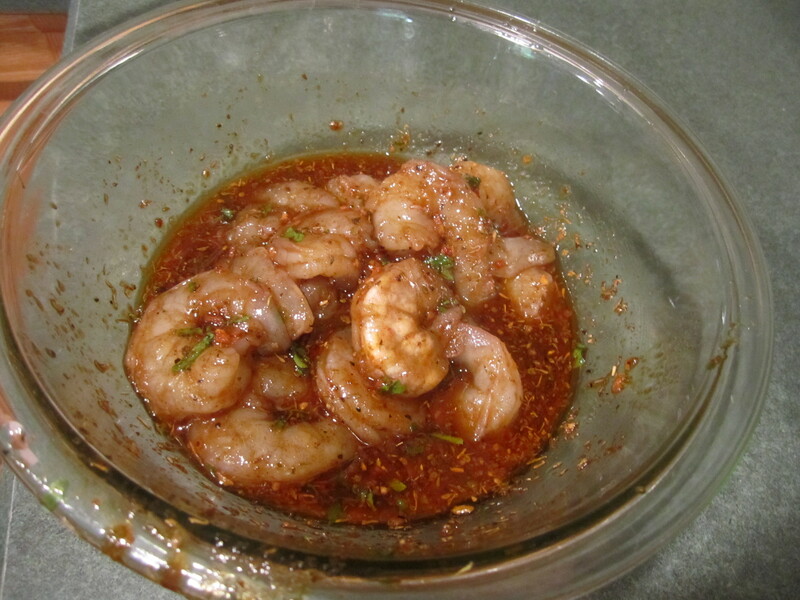 Take the shrimp, toss with the marinade and refrigerate for 15 minutes. 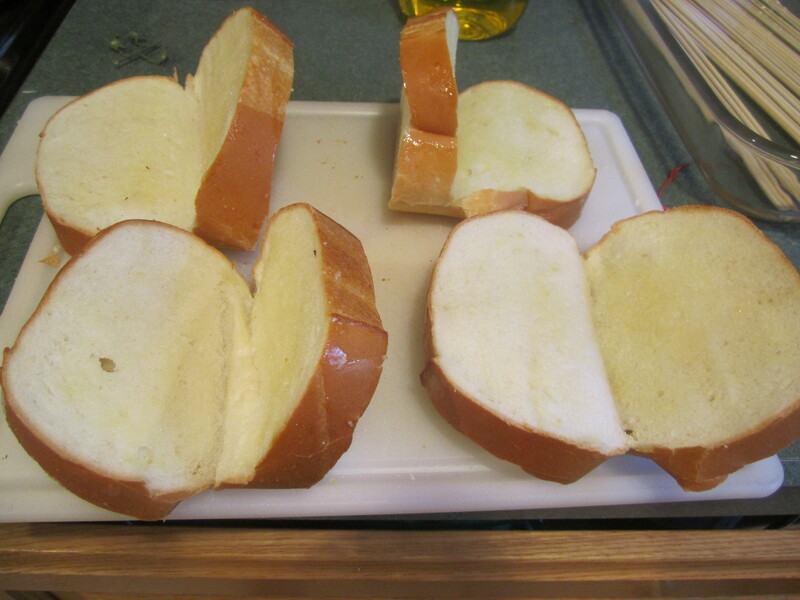 Meanwhile, prep your bread by brushing both sides with the garlic/butter mixture. Set aside. When 15 minutes are up, start threading onto bamboo: take shrimp and pierce through head and tail (this will keep them flat) until you have 4-5 shrimp on the skewer . Keep a little space in between each shrimp. Continue with the rest of the shrimp. Do the same procedure with the tomatoes. I like to keep my shrimp and tomatoes separate and this goes for all kebabs in general. Everything cooks differently and although it might look pretty skewering different items together on the bamboo, I like to keep them separate. 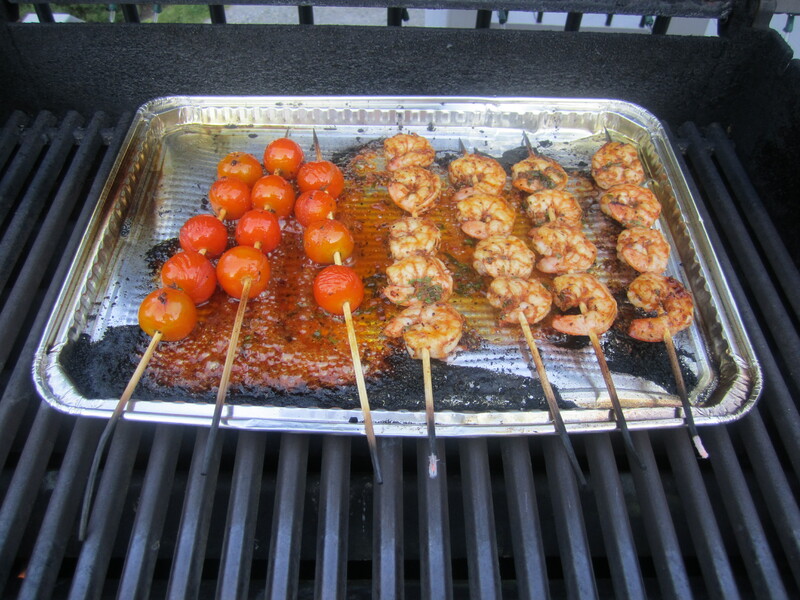 Place shrimp and tomato kebabs onto aluminum pan. 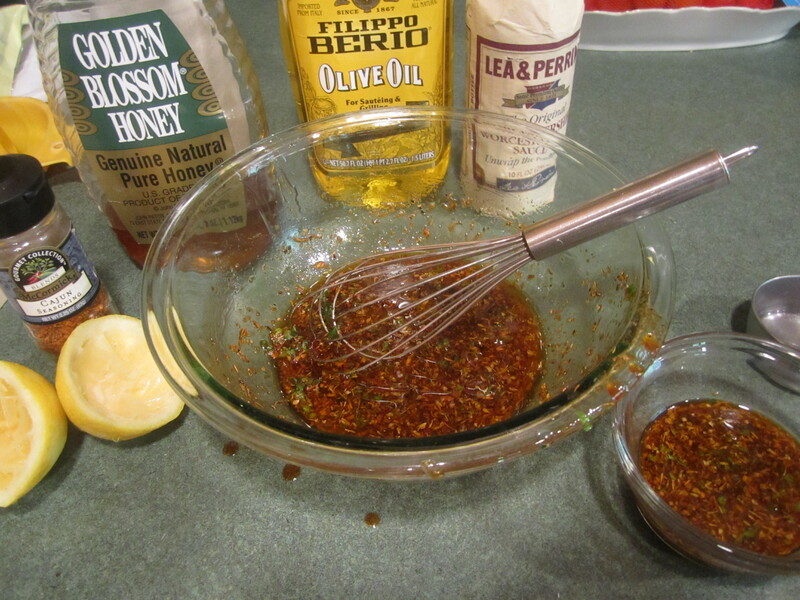 Brush with reserved marinade. Clean grill and place pan onto grates. Cover and leave on high. Cook for 2 minutes. Turn kebabs and brush with reserved marinade. Cook for another 2 minutes. Remove pan from grill. 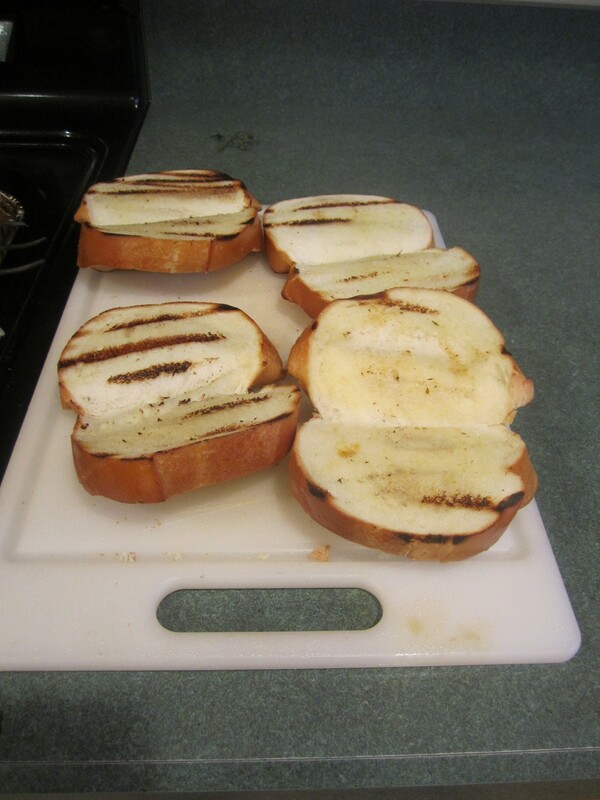 Grill bread directly on grates, for about 30 – 45 seconds on each side until slightly toasted. Carefully remove shrimp and tomatoes from bamboo. 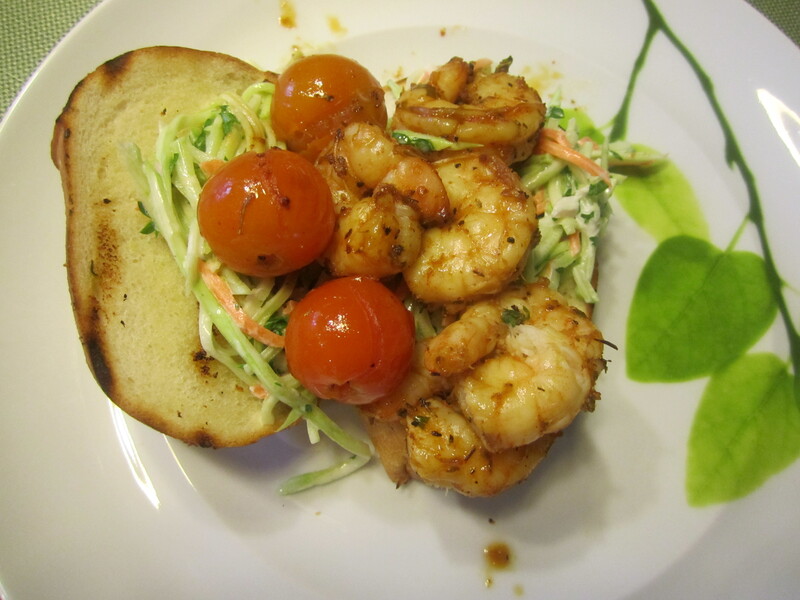 Put some broccoli slaw on the toasted bread and top with 4-5 shrimp and 3 tomatoes. all ready to eat: yum! !